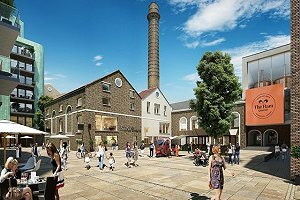 Kier Group has been selected by Greenland Group to deliver the £170m first phase of The Ram Quarter redevelopment scheme in Wandsworth, London. The project, which will be developed on the former Young’s and Co brewery site, involves turning the old brewery into 411,000 sq ft of new build space over a series of three phases with a total project value of £600m. For the first phase of the works, 56,000sq ft of the redevelopment of the Grade II listed brewery complex will be focused on creating housing, restaurants, cafes, bars and boutique shops. In homage to the development’s heritage, the new development will incorporate the brewery’s Grade II listed buildings by way of a micro-brewery and a brewery museum. Some of the site’s historic buildings will also undergo restoration. Enabling works are commencing this month with a phase one completion date set for Q1 2017.